Andy Kaufman skirted the line between nonsense and reality in his performances where during his comedy career; he brought many unique characters to life. Two of the most recognizable are Latka Gravas, a lovable kook on the TV series Taxi, and Foreign Man, a character he created for Saturday Night Live. Kaufman and his work were immortalized in a film called Man on the Moon, where Jim Carrey portrayed him.. 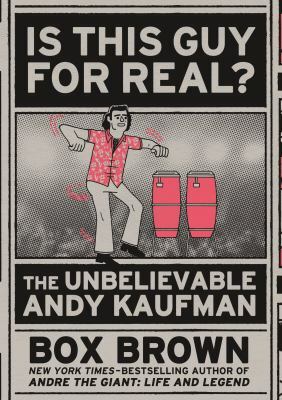 Author Box Brown has now brought Kaufman’s life to another generation in a biographical graphic novel, Is This Guy For Real? The Unbelievable Andy Kaufman. The novel follows his life beginning as child and his appreciation of performing arts, music and wrestling. He enjoyed wrestling so much that he created parodies of his favorite stars bit of humor to the violent world of pro-wrestling. For a time, he put his dream of becoming a wrestler on hold while honing his showman skills with improvisational comedy and television appearances. However, he felt this was not the direction in which he wanted to go. He finally jumped into the wrestling ring, putting on amazing acts and stirring up trouble along the way. His most notable appearance was the controversial debacle with former wrestler Jerry “The King” Lawler. Box Brown’s simplistic pencil drawings and limited color illustrations capture the story of a young man who was sensitive, thoughtful, and very funny. He uses traditional boxed-in scenes throughout the entire book which reads like an original comic strip. The nostalgic style draws (pun intended) you into the story, while moving swiftly through Kaufman’s short life. Brown has made this book more than a biography of Kaufman by including footnotes about the world of professional wrestling without interrupting the flow of the story. There is also an in-depth bibliography of references, websites, television episodes, and personal interviews, as well as a list of books by people in the wrestling industry. 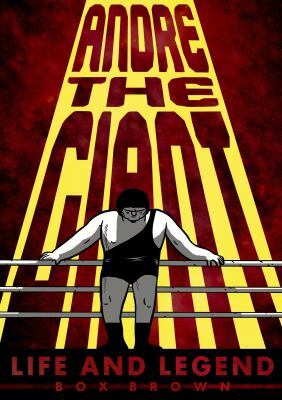 If you enjoy this journey into the life of a comedian turned wrestler, check out Brown’s book about another famous wrestler, Andre the Giant. This entry was posted in Reviews and tagged acting, Adult Non-Fiction, Biography, Graphic Novels, wrestling on June 23, 2018 by Tony.